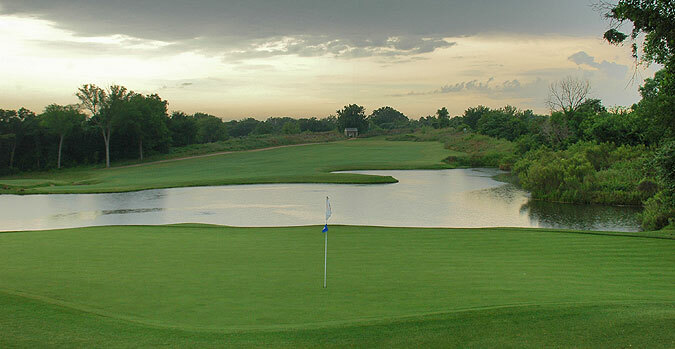 Texas Star Golf Course is owned and operated by the city of Euless, and is a gorgeous property built along a rolling, tree lined terrain with no residences in site. This secluded layout is exquisitely conditioned, and features manicured 419 bermuda fairways and true rolling bent grass greens. The property includes a beautiful clubhouse with well appointed restaurant/lounge and outdoor patio (serving breakfast, lunch and dinner), a nicely stocked pro shop, and locker rooms and showers (for members only). Practice facilities are comprehensive, and include a targeted grass range, beautiful short game area with sand bunker, and large putting green. Lessons of all types are available. Visitors will appreciate the attention to detail that is obviously applied to the course and facilities. The landscaping around the greens, fairways and continuous cart paths is well maintained. On course yardages are marked on all sprinkler heads - measured to the front, middle and back of the large, mildly sloped greens. There is a 150 yard stake and 100, 150 and 200 yard blocks are situated in the middle of the undulating fairways on all par fours and fives. The Kirby marking system is applied to cart paths, with distances posted every 25 yards from 200 (250 on par fives) to 100 yards in. Ball & club washers are standard on all carts. There are four sets of tees that play to distances and slopes measuring 6936 yards/135 slope, 6529 yards/130 slope, 6012 yards/121 slope and 4962 yards with a slope of 124 for women hitting from the forward tees. As these slope ratings indicate, the course plays tough from the two back sets of tees, but is player-friendly from the white and red tee boxes. Forty six soft sand bunkers come into play near the landing zones on the fairways or greenside, and water comes into play in some shape or form on 8 holes. Although trees line all of the holes, there is a significant amount of room on the expansive fairways. The same is true near the raised green complexes, where grassy swales and collection areas present ample recovery room. 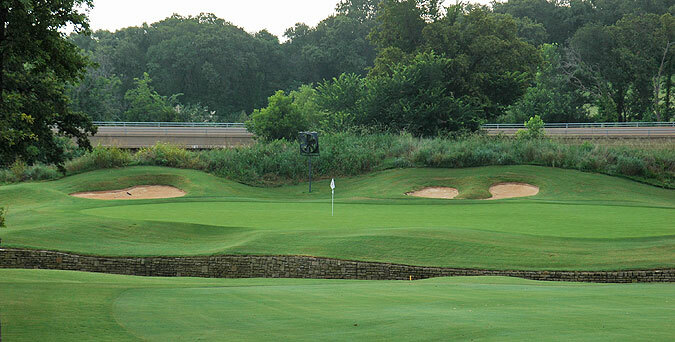 My memory of Texas Star revolves around the well groomed topography, excellent service and interesting hole designs. The burnt orange sand that fills most of the bunkers also creates a lasting impression. This is a beautiful course with wonderful facilities - truly a top notch golf experience - and highly recommended. For more info, visit our page for the course, with direct link to their website by clicking here.